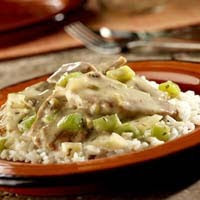 Pork, celery and onion are coated in a creamy sauce and served over a bed of rice for this satisfying family supper. Heat 1 tablespoon oil in a 10-inch skillet over medium-high heat. Add the pork and cook until well browned, stirring often. Remove the pork from the skillet. This entry was posted on 10:07 PM and is filed under Pork . You can follow any responses to this entry through the RSS 2.0 feed. You can leave a response, or trackback from your own site.